Does anyone have any thoughts/pictures/stories they want to share? Lets put together something and then we'll get it in there so that way everyone can see it and have something to remember him by. i only have one story about Lion. i met him last year at SoCal Fest. he walked into my camp at 6am sunday morning with a beer i had never heard of in his hand and said "here". we chit-chatted a bit while we had our beers, and off he went to continue meeting the rest of the group. hell of a nice guy, and a damn good beer. well killed that bottle together and we both passed out next to the fire. i don't know the coords. 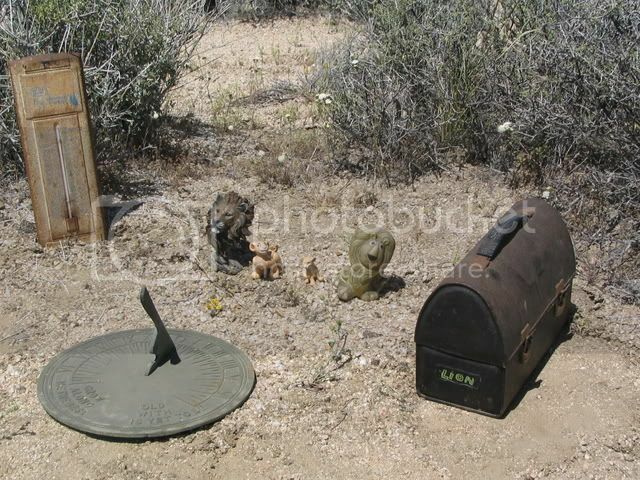 but there is a geo-cache in his memory behind the mailbox on the mojave road. Geeze I don't know what would be better to share his comments about how beautiful it was every where I saw him and how glad he was to be there or the memories of him walking through camp greeting folks at all times with a drink of some sort and a smile.